Custom built in the 1/1000 scale, this diorama represents a fierce battle between The Starship Enterprise and a Klingon D-7 cruiser. Both models in this particular diorama have been built to duplicate the studio miniatures seen on the DS9 episode entitled "Trials and Tribbleations", but they can also be built to replicate the original series miniatures. 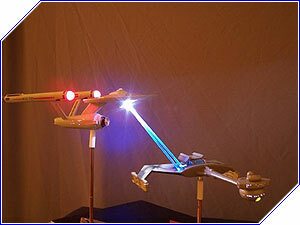 The Enterprise has multi colored rotating bussards, 60% of its windows lit, blinking navigation lights and a unique feature, blue phaser beams emanating from the ventral saucer. The Klingon Battle Cruiser has slightly raised hull plating, all of its windows lit, lit torpedo launcher as well as rear impulse engine, and a hull breach damage effect. Both models are mounted on a custom base stand, each with its own symbol.